Day 3 of the NY2LA Sports Lone Star Invitational in Dallas, Texas featured several high intensity contests as teamed battled on the final day of the tournament. Several players stood out, including Isaac Lindsey of the Wisconsin Swing who remained red hot from distance and Tyson Acuff of R.E.A.C.H. Legends who continued to drop dimes. An elite level shooter, Lindsey showcased his outside shooting as well as his all-around game in a win over the Illinois Irish Elite. He’s money from distance, but is also able to put the ball on the deck and attack the basket and find open teammates as well. One of several Titan guards that plays with tremendous effort and intensity, Blackburn helped spark a stalling Titan offense on Sunday against Yanders Law scoring eight second half points and finishing with a team-high 13 to help lead his squad to a comeback victory. 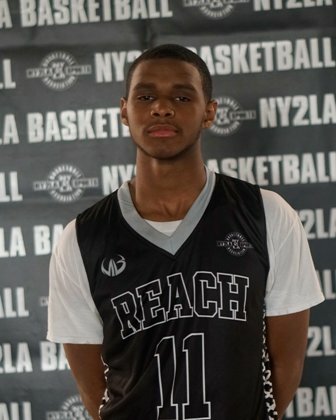 Watts has elite speed and quickness and is a blur in the open court and had one of the better individual performances in Sunday’s 15U division that we saw as he led his squad with 22 points and to a hard-fought win over a good R.E.A.C.H. team. Williams has the ability to make things happen off the bounce and uses good handled to set up drive to the bucket or pull-up jumpers. He couples those skills with an aggressive mentality. These guys all play hard, but this kid completely takes it to a different level. His intensity level at the defensive end is fun to watch. Dives for loose balls, works hard on defense all the time. At the offensive end Swansen can knock down the 3, handle the ball a little bit and moves really well without the ball. He had just five points and five rebounds in a come-from-behind win over Yanders Law, but forced a pair of crucial turnovers in the final 90 seconds of play to swing the momentum in the Titans’ favor that helped capped the comeback. Might have been the best long term college prospect we saw over the weekend in the 15U division. Acuff made some beautiful look away passes on the break with pin-point precision to open med under the basket, on the baseline or wide open in the corners in a loss to All in Athletics Williams. R.E.A.C.H. Legends struggled to make point blank lay-ups in this one, shots they normally would make, but Acuff impressed again on Sunday and continues to raise his profile. Brookshire continues to play at a high level and turned in a terrific performance in a close loss to Colorado Titans Gold on Sunday. A terrific young point guard, Brookshire led all scorers with 18 points, but also led both teams with eight rebounds from the PG position. Hagen is a skilled 6’3 wing who is a solid ball handler and has great court vision. He made several eye-popping passes in a runaway win over Example on Sunday and finished with nine points and four rebounds. Can put the ball on the floor and attack the basket and plays bigger than his listed 6’3 height due to his length. Had one of the better shooting performances we saw throughout the weekend, kid can really fill it up. A 6’0 guard, Tuckers scored 25 in a win on Friday and continued his strong play on Saturday and Sunday. Had a good game in a win over Illinois Irish Elite. Made some nice passes, puts the ball on the deck and gets into the lane. A solid young prospect to keep track of moving forward. Has good size at 6’3 and can play either guard position. He is a scrappy defender that really competes and brings energy and defensive intensity to the court. A 6’7 wide body, Fanning is a huge big man in the middle for All In Athletics and does a great job of standing his ground in the paint defensively. Has good hands and catches the ball in traffic and has a soft touch around the basket. Uses his body well at both ends of the floor. He is a bouncy athlete who is quick off his feet. Offensively he is raw, but can play above the rim and stick an occasional mid-range jumper. At 6’5, he can play above the rim at both ends of the court. Had one of the nastiest dunks of the weekend in the 15U division on Sunday against All in Athletics Williams when he threw down a one-handed power slam off a feed from Tyson Acuff. Bush is an explosive athlete that competes in the paint and around the rim. A really good rebounder who is a versatile defender, can guard a guard, or muscle up with a big in the post. Big, strong frame. Is listed at 6’5 but swallows up others players listed at that height due to long arms and big frame. Is a good defender and rebounder and showed the ability to finish around the basket in a runaway win over the Illinois Irish Elite. Can handle the ball a little in the open court, able to go end-to-end and attack the basket on the break. Although he is small — generously listed at 5’6 — Haney doesn’t let his stature slow him down. He’s a solid ball handler with the flair for the spectacular play off the bounce, can get to the bucket and has a smooth 3-point shot. One of the few 2021 players at the 15U level this past weekend, Haney came off the bench for Yanders Law and poured in eight points to lead his team in the first half on Sunday against the Colorado Titans Gold. Good sized kid at 6’7 with a good frame. Has an emerging post-game and is able to play with his back to the basket. Defensively he had some nice blocked shots as he helped protect the bucket in a runaway win over Example Sports on Saturday.